I realised that whilst my kids go at least once a week, I hadn’t used my local library for nearly 2 years!! A new found love of my Kindle – and being given books to review – meant I hadn’t actually borrowed anything for myself for all of that time. 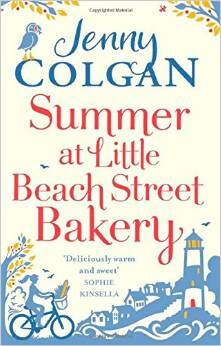 So I decided to rectify the situation and borrowed ‘Summer at the Little Beach Street Bakery’ by Jenny Colgan. “Summer has arrived in the Cornish town of Mount Polbearne and Polly Waterford couldn’t be happier. Because Polly is in love: she’s in love with the beautiful seaside town she calls home, she’s in love with running the bakery on Beach Street, and she’s in love with her boyfriend, Huckle. It was a lovely, easy, holiday read. Not earth shattering literature – but a fun escapist romp and I was keen to find out what happened next! Some of it is a little far fetched (pet puffin anyone?!) and some a little predictable (I immediately guessed the culprit for the graffiti on the side of the van) but overall a pleasant book to read. It reminded me very much of the style of Jenny Oliver, whose books I’ve reviewed before. I’m not sure I’d rush to buy all of Ms Colgan’s back catalogue – but perfect as a library book. I think I might have to go and borrow the first book in the series to see how Polly got to Mount Polbearne in the first place.